Why do smaller models stretch their legs while they dance? 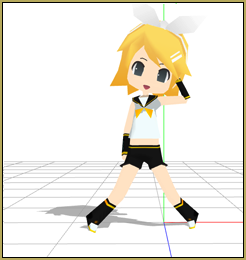 How can I make my chibi models dance normally in MMD? What is the multiply of bone frame position-angle function? There are models out there with all different shapes and sizes, and every now then we’ll find them dancing to a fun little routine… But something’s off. It looks like a spindly mess of stretchy limbs trying to touch the floor as your dancer defies the laws of gravity and stomps in the air. Sure, that can be cool. But this is not what we’re looking for. But You Can Fix That! 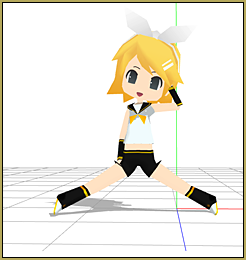 Nano Rin is not a standard sized model, but her bones (more specifically IK bones) are still being “ordered” to fit the original motion data. We can fix this by going into edit>multiply of bone frame position-angle. 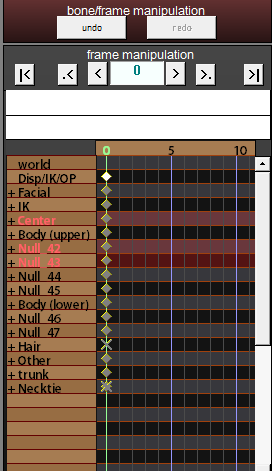 First, you want to select all of the motion frames by going to the EDIT tab and clicking on each of “select all bone”, facial, and IK. Now your model may have jumped to a different position, and the dance should be adjusted to suit it! 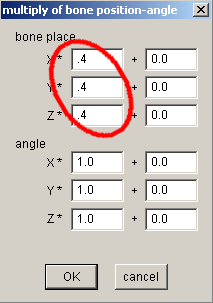 You can always change the values to a different number depending on the model being used. The smaller the model, the smaller the values, and the larger the number the model, the higher the value. Even though the effort is minimal, using the multiply of bone frame position- angle function does enough tweaking to your project to make it more pleasing to look at. And nothing can go wrong with using it (at least as far as my experience goes). If you don’t like the changes you made, that wonderful “undo” button can kick in. 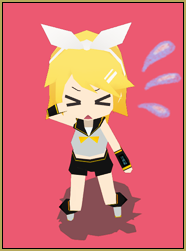 But for now, happy MMD-ing! Oops, hit the post button too soon! Anyways, how can I fix this? Moving them with the center position bias doesn’t fix the issue, the models move back into their original places. Edit your models in PMDE/PMXE to have motherbones. Center position bias isn’t a good way to adjust premade motions, since you ‘d have to fix *every* time the center bone is moved, and it can happen a lot. Yes, you can do it. Instead of clicking those “select all” commands in the menu, you only manually shift-select relevant bones. Then, in FMP, you type starting and ending frame numbers, select “Sel Bone” or “All frame” item in the list (if it wasn’t selected already) and hit “range-sel”. After that, proceed with multiplying as described. That’s weird– you shouldn’t have to adjust facial motion data to a smaller model. Facials are usually handled appropriately by the model. If they aren’t, it’s likely an issue with the design of the model or of the motion. However, there is a command similar to bone frame multiply. Select all facial frames, then edit->multiply of facial expression will let you scale all of your facials down (or up, but you probably don’t want that).